As I stepped off the plane into the dark Kuwaiti desert a wave of hot moist air hit me. I was in the Middle East, all of those months of endless training had led me to this. For the next three weeks we sat in Kuwait and tried to “adjust” to our new environment. Going on mile long runs in full combat gear was not uncommon, neither was dehydration and heat exhaustion. We drank bottle after bottle of water and prayed we would be sent to Iraq soon because it was thought to be cooler there. Our barracks were huge 150-200 man tents and we slept on cots right next to one another row after row. Sometime towards the end of September 2nd Battalion 8th Infantry Regiment finally received orders to pack up and make the move to Iraq. We arrived in Baghdad under the veil of darkness, but the air base was full of activity. It was incredible to see the true might of the U.S. military. As we sat on a helipad waiting for Chinook Helicopters to ferry us 45 minutes south to the city of Diwaniyah, a huge explosion and fireball went off in the distance followed by the sound of small arms fire and sirens. It was very clear to me then that I was in a far different place than I had ever been before. Forward Operating Base (FOB) Echo didn’t look like much, but it was home to a multinational coalition of troops from Poland, Bosnia & Herzegovina, Mongolia, and the United States. Our Battalion quickly established overall command of the base and assumed responsibility for full spectrum combat operations. My platoon was tasked with protecting the Battalion Commander of 2-8 IN. Over the course of twelve months we conducted over 200 around the clock combat patrols, ensured the conduct of fair and free provincial elections, and trained Iraqi security forces to be a professional organization. Our schedule was demanding and the business we took part in was very serious. 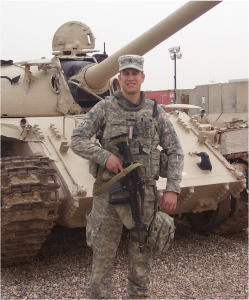 November 1, 2008 was a day that started out similar to most, the platoon woke up, worked out, and received our mission brief. We were told that a couple days prior, a U.S. soldier had accidentally run over an Iraqi Army soldier with a Mine Resistant Ambush Proof Vehicle (MRAP) and killed him. Our platoon was given the task of driving to the Shi’ite holy city of Najaf in order to deliver the condolence payment to the Iraqi soldiers family. We loaded up into our MRAPs and M1114 Up Armored Humvees and departed on the three hour drive. One hour had gone by and thus far the drive had been hot and uncomfortable. I looked out the side window and thought about my best friend who was getting married that same day. I had been away from home for three months and war had lost much of its glamour to me. Then it happened. A large explosion deafened my ears while dark black smoke and orange fire consumed the lead Humvee. The radio chatter immediately went from laughter and conversation to barking orders and .50 caliber Machine Gunners asking for target confirmations. My mind was swirling with questions and I was sick to my stomach. I was the only Medic in the convoy and I knew it was up to me to get those men out of the damaged Humvee as soon as possible. I heard my Platoon Sergeant telling me to jump out the moment our truck stopped. As the driver slammed on the brakes I swung the heavy armored door open and ran out into the road at a dead sprint toward the downed truck. I felt so naked and exposed. I thought about the small arms fire going on around me and the chance of there being a second Improvised Explosive Device (IED) set up in order to massacre the Soldiers who would surely rush to save their comrades’ lives. 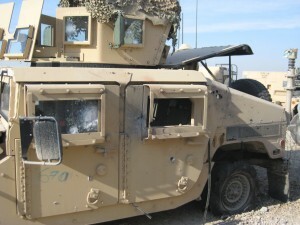 After the IED: Humvee after being struck by an explosively formed penetrator (EFP). As I reached the truck smoke filled my lungs and I could feel the heat on my face from the fire. Without hesitating, I opened the door. Nothing could have prepared me for the sight I was about to see. Five of the closest friends I’d ever had were sprawled about inside the truck covered in blood and moaning, but miraculously everyone appeared to be alive. I immediately began applying Combat Application Tourniquets to the shattered limbs of the wounded men as other soldiers arrived and with mechanical like efficiency began to do the same. We knew through training that to stay in the “kill zone,” the immediate area in which the IED goes off, is not the place to be so the decision was made to move the wounded to be loaded in the large MRAP vehicles. Myself and two other soldiers who I felt were medically competent went with the three most severely wounded members of the platoon. Executing his training to a T, my Platoon Sergeant had already called up a Medical Evacuation Helicopter which had responded saying it would meet us at a designated casualty collection point in twenty minutes. Sitting in the back of that MRAP for the next twenty minutes felt like an eternity. Dressing wounds, initiating IVs, checking vital signs, and trying to calm the conscious patients were all things that happened on our way to the evacuation site. Finally, the MRAP lurched to a halt and in the distance you could hear the chopping rotary wings of the helicopters heading in our direction. They were like angels in the sky. I had never felt so relieved in my life. We waited for the two UH-60 Black Hawks to land, then immediately loaded the five wounded patients on to the birds. As the helicopters took off an enormous wave of relief and exhaustion swept over me. I started to shake. My eyes became moist. I thanked God for seeing me through the day and allowing me to keep my men alive.